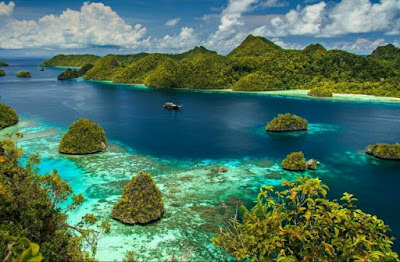 Raja Ampat, West Papua, as one of the best tourism destination in Indonesia. Indonesia was awarded the Best Dive Destination 2017 by British Dive Magazine at the World Travel Market (WTM) London held in ExCel London, England, from Nov 6 to 8. The award was delivered by Dive Magazine publisher, Graeme Gourlay, to Indonesian Tourism Minister, Arief Yahya, at the Wonderful Indonesia pavilion during the largest tourism exhibition in London on Tuesday (Nov 6). Yahya expressed his gratitude to the magazine for choosing Indonesias diving sites as the best in the world and to those who voted Indonesia as the best diving location in the world. The award is expected to encourage Indonesia to continue to maintain the sustainability of marine tourism, especially diving. Indonesia collected 1,076 votes out of 9.399 votes, or 11.45 percent of the total votes. According to the minister, the award from Dive Magazine is a global recognition for Indonesia. Gourlay stated that Indonesia has the best diving destination in the world, mainly because of the various corals that grow in the countrys sea. He added that Indonesia has been conducting the best conservative actions. "You have got the most beautiful coral in the world," he remarked, hoping that the Indonesian people can continue to preserve their maritime wealth. The awards presented by Dive Magazine are divided into three categories, namely the Dive Travel Award: Best Destination 2017, the Best Dive Center or Resort 2017, and the Best Live Board 2017. With about 17 thousand islands, Indonesia has thousands of species of animals and attractive natural wealth. Indonesia has recorded the highest repeat visitors. Dive Magazine published Indonesia as having popular destinations such as Komodo National Park in East Nusa Tenggara and Lembeh Island in Bitung, North Sulawesi.